This park is located in the department of Jalapa, 118 km from the Capital City, approximately 2 hours away by car. In this park we can find 6 waterfalls, two of them 30 meters high. In the park we can perform various activities such as hiking, rappel, extreme swings, mountain biking, canopy, eco accommodation and camping, a quality that makes this park special that allows the entry of pets so the entire family can enjoy a walk through the waterfalls. The waterfalls of Urlanta are one of the beauties that can be found in the department of Jalapa, one of the waterfalls is approximately 70 meters high and is fed by very cold water that comes from the mountain. The place is surrounded by a large number of trees and a variety of birds can be observed. Due to the type of terrain rock climbing can be done with safety equipment. It is located in the Pino Dulce village, municipality of Mataquescuintla, in the department of Jalapa, only 90 kilometers from the capital city. It is located at the highest point in the eastern part of the country, at an altitude of 2,450 meters above sea level, so the climate is cold. The park is open from 7 am. to 6 pm. Everyday of the year. After 6 p.m. Only people who camp and need a previous reservation can enter. This unique spa is located in San Pedro Pinula, Jalapa. It is a special spa because it uses the alkaline waters of the “Quebrada Los Chorros” to form pools of natural non-stagnant water where the water runs with small waterfalls between the pools. At the bottom of the pools, the white color caused by the alkaline water stands out, which with the passing of time has been colored. Located in Santa Rosa, it is the only lagoon in all of Guatemala to be of sulfur water, this is due to the actions of the Tecuamburro volcano. It has a characteristic color that varies between mint green and light green, depending on the time of year. Due to its high sulfur content, aquatic life does not develop inside the lagoon. Another limiting factor is the high temperature of the same since according to visitor accounts, it has been observed how the water boils in the middle of the lagoon, making it unlikely to be able to bathe inside the lagoon. The lake is located in Asunción Mita, Jutiapa and something interesting is that its surface is shared by El Salvador and Guatemala. 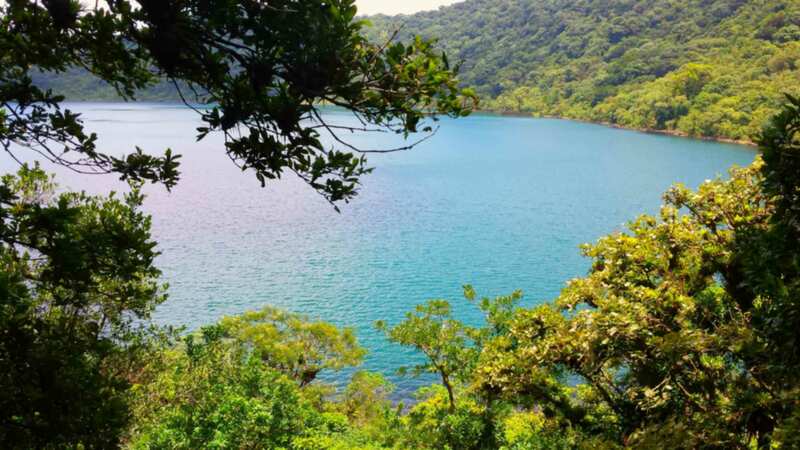 In this lagoon we can find different woods such as nance, cedar, mahogany and rubber, being an ideal habitat for different animals such as the quetzal, the zenith, lizards and some species of snakes. The Ipala Lagoon is located inside the crater of the volcano that bears the same name. The rise of this volcano takes about an hour and thirty minutes. It is located between Chiquimula and Jutiapa, and is characterized by being easily accessible, so it is one of the first options for people who start hiking or climbing volcanoes, as it is considered one of the easiest summits to conquer. On the site you can perform different activities such as hiking, camping, take baths in the lagoon and stay in cabins. You get to the town of Agua Blanca, place that will be the starting point for the ascent, going through several villages and there are approximately nine kilometers to the summit. Another route of ascent is always starting from Agua Blanca, which crosses the Zacarías Hill, this path is one of the most interesting and picturesque, it has an approximate distance of 6 kilometers. However, it is more complicated and you need to travel by car seven extra kilometers. On the southern slope of the volcano, the Monterrico volcano is located at 1,320 m.s., which is why it is advisable to make the summits in one trip. Located in the municipality of Jalpatagua, Jutiapa, it combines the existence of a grotto, in whose mouth you can find 3 pisicnas that are fed by sulfur water from the cave itself. The water, crystalline as few, comes from inside the cave, which is why it is notoriously fresh. It is frequented by national and foreign tourists, for whom a refreshing bath complete a day of walks, adventures and explorations, surrounded by a pleasant nature. It is the Central American capital of the Faith, where hundreds of pilgrims arrive to visit the Black Christ of Esquipulas throughout the year and especially on January 15, when the parishioners come to make requests to the creator as well as penance, which is a demonstration of love and Faith. It is a baroque work of the eighteenth century, the Basilica of the Holy Black Christ of Esquipulas is considered the largest Catholic temple in Central America and is a historical and artistic monument since June 12, 1970. It has four bell towers, consists of three naves, a dome that naturally illuminates the interior, an atrium delimited by 6 columns and has silver lamps with cut crystal almonds. The Basilica is visited by pilgrims throughout the year to see the Miraculous Image of the Lord of Esquipulas, the Black Christ, which was sculpted in cedar wood by the sculptor Quirio Cataño. The Black Christ is credited with miracles and you can see offerings and plaques of veneration, during the journey towards observation and contemplation of the image. At 6 kilometers from the departmental capital of Zacapa, is Estanzuela, a town known for the hand embroidery that its women make and, above all, for the Museum of Paleontology, Archeology and Geology, Eng. Roberto Woolfolk Saravia, which exhibits an extraordinary collection of skeletons of prehistoric animals, a burial chamber from a Mayan cemetery and archaeological lithics, among other pieces of incalculable value. According to comments on November 22, 1896, a train arrived at the station of Zacapa for the first time, from that date the railway station became important due to the convergence of the train’s branches coming from: Puerto Barrios (Izabal) , the capital of Guatemala and El Salvador. The central station operated for many years, until a fire in the year of 1995 was almost completely destroyed. After some time with the purpose of not losing a legacy of the past, the idea of ​​creating a museum arose, which is currently located in the Barrio La Estación, in the municipal capital of Zacapa, in the Department of the same name. It has been open to the public since 2004 and exhibits, objects such as: furniture, tools, medical equipment, office equipment (1920), accounting books (1905), telegraphy devices (1930), radio transmitters / receivers (1935 – 1940). Likewise you can see the old wagons, the fuel tanks, the small cart-type platforms and the wagons. The museum is staffed by ex-railroad workers who, with the experience acquired in their work, enrich the visit to the museum.